An additional challenge for the design team was to ensure that the kitchen would withstand the harsh Chicago elements; the countertop was done in honed granite and the cabinetry is marine-grade teak. To bring the modern design into harmony with the natural surroundings, a neutral palette was selected to complement the aesthetic inside the home without detracting from the lush green of the outdoor space. How often does the Teak require treatment or sealing? @ermd, the teak does require some maintenance. We suggest oiling it every season, or as necessary to withstand fading. What is the manufacturer of cabinetry? @knrjdm, thank you for inquiring! Fredman Cabinetry is our cabinetry division. If you have an interest in our cabinetry for your project, please email us at info@fredmandesigngroup.com. I would like to get more info on the cabinets, who could I contact for that? Fredman Design Group would love to learn more about your project. Please contact info@susanfredman.com to work with one of our designers. @poops727, of course! Everything is a la carte. These were custom cabinets for our clients. Please contact us at info@fredmandesigngroup.com for ordering information for your project. Hello I have used this picture by mentioning your company name in my blogspot. Please check the below link and please do not hesitate to contact me if you have any trouble or you need any change. Photo Permission? - Beautiful honed granite countertop! May we have permission to use this photo alongside an article on outdoor stone countertops on www.CountertopIQ.com? We would like back to your Houzz page. Thanks! what is the flooring material? What wood species are the cabinets? What granite color are the countertops? Granite - what is the "color" of this honed granite? Thank you! How are you lighting the counter tops ? 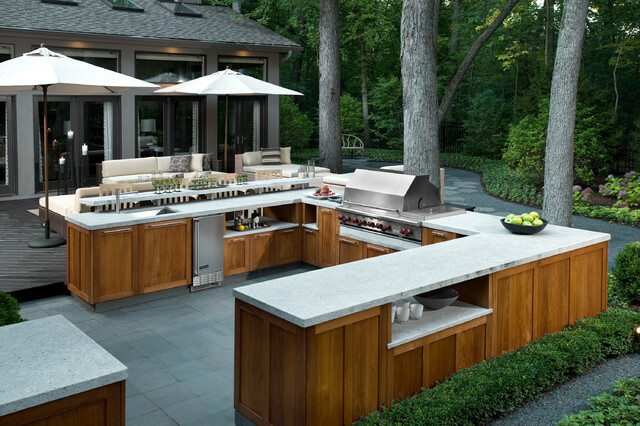 But if you’re truly interested in entertaining and using your outdoor kitchen as a full-service operation, then you’ll want to consider a bigger prep space and features like an outdoor refrigerator, sink, storage space and a bar or proximity to an entertaining or eating area.